Easy and quick setup with no expertise. Start selling ticket to your event in minutes. Click on any use-case to learn more. Easy setup with box-office features, POS (point of sales) and easy ticket scanning. For all your fund raisings, donations and other events that you may sell tickets for. Easy to be managed by your members or volunteers. Enjoy the non-profit (charity) discount both from Ticketor and your payment processor. Easy to manage by members or volunteers and easy to create your custom seating chart for any ballroom. Enjoy the non-profit (charity) discount both from Ticketor and your payment processor. with powerful scheduler, simply schedule events and classes on a daily, weekly or monthly basis. Schedule multiple events per day and exclude special holidays. Simply design your venue's seating chart and tables and sell tickets both for your general admission events and table reservation. Create different packages and price levels per table. Sell tickets to one-time or recurring conferences, seminars and workshops all around the world using the multi-currency feature. 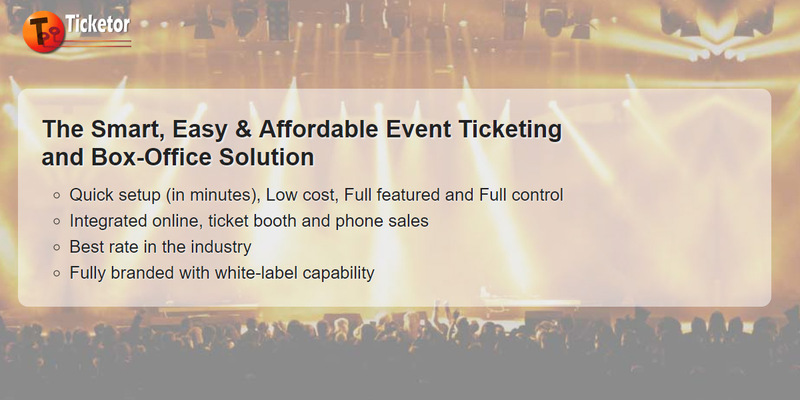 Create a full-featured, white-label (fully branded) ticketing website and box-office system and sell tickets to your own events or offer the service to other event organizers. Powerful seating chart designer, compatible with all type of seating charts: amphi-theater style, round table dinner style, night club style and any combinations. Simply build your own seating charts at no cost. Churches, Synagogues, ... Use Ticketor for all your events, galas, fund raisings, high holiday, community events, luncheons, getaways, youth events. Enjoy the non-profit (charity) discount both from Ticketor and your payment processor.